On April 14 and 16 2016 two major earthquakes caused many fatalities, injuries and widespread damage in the Kyushu island prefectures of Kumamoto and Oita. We asked Kumamoto Governor Ikuo Kabashima about the situation in his prefecture today. The city of Fukuoka, where many game companies are based, aspires to become a Mecca for the global game industry. Government, academia and industry have come together in eastern Kyushu to establish a "Medical Valley" that will improve medical care - particularly in the field of blood medicine - far behind the island's shores. In this article, we introduce one onsen from each of the seven prefectures of Kyushu. On JR Kyushu's Design & Story trains, getting there is half the fun. In this article, we highlight one famous dish from each of the island's seven prefectures. 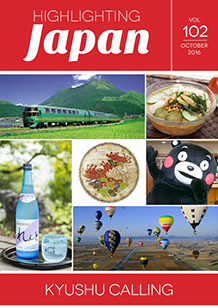 Kyushu is known as the birthplace and heartland of the national drink known as shochu, (distilled liquor). Kyushu's remote Amami islands meanwhile are known as the production center of a rare and special variety of the drink, kokuto shochu. Green tea connoisseurs Holly Helt and Alex Sanson are introducing a fresh take on the brew to the tea drinkers of Japan through their popular Chiki Tea cafe and online store. Kagoshima's traditional craft object the Satsuma button has been given a new lease of life by designer Shiho Murota. The spa resort of Beppu in Oita Prefecture is home to one of Japan's last remaining bamboo weaving communities. The cultural legacy of the Sagara clan lives on in Hitoyoshi Kuma, Kumamoto Prefecture.